You have passed 12th Standard, and you want to join the Indian army. But you don’t know about the Indian army vacancy for 12th Pass. Yes! This article will educate you for applying for the Indian army after you have completed 12th Standard. Selection is made through its Soldier recruitment process; the Indian Army is known to give training and jobs to 10th, 12th, Diploma, and ITI passed students. There are many trades, which 12th Pass candidates can apply for! In this article, those jobs for various posts have been included! So, if you are looking for an Indian army vacancy for 12th Pass, then this post can be helpful for you! You can also see – NDA 2019 Registration and AFMC 2019 Registration. 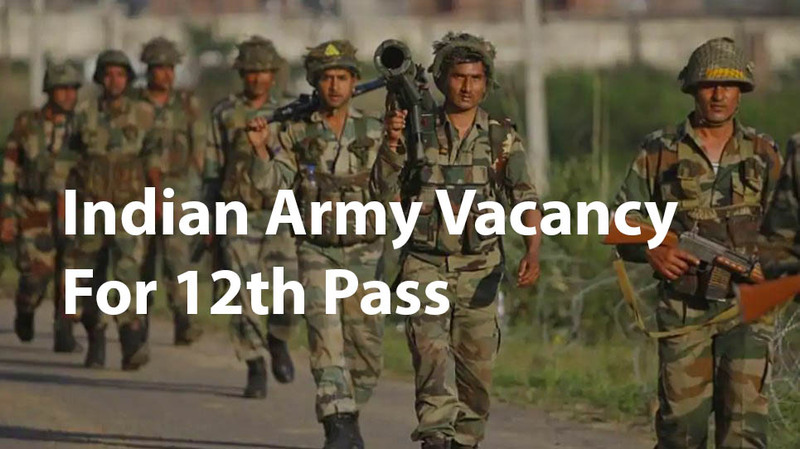 Note: Indian army vacancy for 12th Pass candidates also have officer entry. In this article, I have focused only on military entry and military posts, therefore, if you want to become an officer after 12th. The recruitment in the Indian army vacancy for 12th pass candidates’ jobs is under the ‘Soldier’ and ‘JCO’ category. There are many trades available Within the Soldier and JCO categories. As I mentioned earlier, recruitment in the Indian Army is also done for 8th and 10th passing candidates so that vacancies are filled. 12th pass candidates are eligible for these trades as well. As a result, I’ve mentioned posts that require less qualification than 12th Passed. The candidate should be 12th Pass with science, chemistry, mathematics, and English with 50% marks in total and 40% marks in each subject. Or a three-year diploma in engineering (mechanical/electrical/automobile/computer science, mechanical engineering and electronics and instrumentation engineering) from a recognized polytechnic institute. The candidate should have passed With 45% marks in SSC / Matric with an aggregate of 33% in each subject. If a candidate applies with higher qualifications, then the percentage will not be considered. Soldier Nursing assistant: 12th Pass in science with a minimum aggregate of 50 % in physics, chemistry, biology, and English, and a minimum of 40% in each subject. The percentage is not considered if a candidate is a BSc graduate in Botany/Zoology/Bioscience and English as the main subjects. But the candidate must have studied all the four subjects in 12th Class as well. The candidate should be 12th Pass with 60% aggregate in arts, commerce, science and a minimum 50% marks in each subject. Should be 10th 0r 12th Pass with English and maths/Accounts/bookkeeping with 50% marks in each subject. If the candidate has a BSc degree with English and maths as the subject. In case of the graduation without English and Mathematics / Act / Bookkeeping, they should get more than 50% marks in English and Math / Act / Book Keeping, at least once in 10th Or 12th. The candidate should be 10th or ITI pass. The candidate should be 12th Pass or equivalent Diploma / Certificate Course of 1 year or more duration in Catering Technology and Cookery Hotel Management from a reputed University or a Food Craft Institute. AICTE recognition is not mandatory. Soldier Technical (Aviation and Ammunition Examiner): 17½ to 23 years. Soldier (General Duty): 17½ to 21 years. Soldier Nursing Assistant: 17½ to 23 years. Soldier Clerk/SKT (All Arms): 17½ to 23 years. Soldier Tradesmen (All arms except SVCE, mess keeper and housekeeper): 17½ to 23 years. JCO (Catering): 21 to 27 years. Indian army vacancy for 12th Pass candidates is conducted as an Open Rally and recruitment drives to fill the vacated posts. If you want to apply to the recruitment process, the 1st step is to get yourself for registered for the Open Rally. Medical tests will be conducted to make sure; the candidate is medically and physically fit. A CEE is a written test. A final merit list is prepared on successfully completing the above-mentioned tests. The number of marks scored by candidates makes the difference in the merit list. Candidates who deserve are featured in the merit list and selected for training. There is an Indian army vacancy for 12th Pass candidates in all the States and UTs throughout India. Information regarding the schedule of the Open Rally schedule is published in the Indian army website and newspapers. I hope this will help you in applying for an Indian army vacancy for 12th Pass. Also, you can find all the details to apply for Indian Railway jobs here.